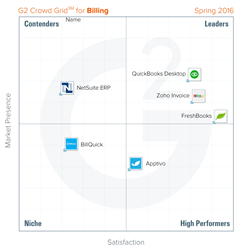 G2 Crowd, the world’s leading business software review platform, today released the Spring 2016 Billing Software Grid report to help businesses make the best billing technology decision. QuickBooks Desktop and Zoho Invoice were named Leaders in the report, receiving strong customer satisfaction scores with a large market presence. FreshBooks and Apptivo were named High Performers in the report, earning strong customer satisfaction marks with smaller market presence scores. FreshBooks earned the highest overall satisfaction score, while QuickBooks Desktop earned the highest overall market presence score. Support strength — Users of nearly every billing tool included in the report praised the quality of customer service provided. Four of the six products received a satisfaction score of at least 87 percent for quality of support. Web-based vs. on-premise — Four of the six billing products are web-based, and frequently those users found web access to aid productivity. Many users also appreciated having a mobile application to use on the go. However, not all of those tools had offline access, which was an issue for some users. Integration importance — Reviewers of most of the billing products wrote about the importance of integrating with other tools. They integrated billing products with time tracking, accounting, CRM, and other software with mixed results. The report is based on more than 150 reviews written by business professionals. Of the roughly 91 products listed in G2 Crowd’s billing category, the ranked products each received ten or more reviews to qualify for inclusion on the Grid. G2 Crowd, the world’s leading business software review platform, leverages more than 75,000 user reviews to drive better purchasing decisions. Technology buyers, investors, and analysts use the site to compare and select the best software based on peer reviews and synthesized social data. Monthly more than a half-million people visit G2 Crowd’s site. Co-founded by the founder and former executives from SaaS leader BigMachines and backed by roughly $12 million in capital, G2 Crowd aims to bring authenticity and transparency to business technology research. For more information, go to G2Crowd.com.